Local citizens enjoy Senior Day at the Gallia County Senior Center, getting a free lunch and enjoying games together. 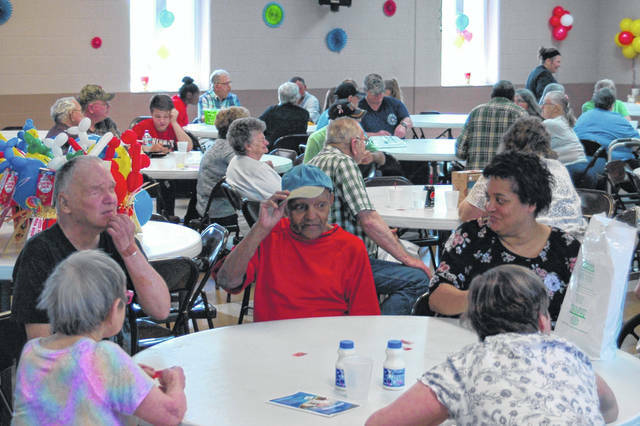 GALLIPOLIS — Gallia County citizens came together to celebrate seniors for the annual Senior Day at the Gallia County Senior Center on Ohio 160. The day was open to the public and offered a variety of activities for seniors and company. “We just want to celebrate seniors and give them some information about different programs that are available to them and to come together and have a good time,” said Heather Johnson, adult day services coordinator. Various games were on hand as were door prizes and a free lunch. Several vendors were also invited to discuss what they offer to senior citizens from hospice companies to government offices and charity organizations. God’s Hands at Work, the Ohio Attorney General’s Office, and others were present for the event. According to Johnson, a large part of the day was telling others about the day services the center offers to seniors on a daily basis. Hours are Monday through Friday, from 8 a.m. to 4 p.m., offering community and activities for participants, as well as a hot lunch and transportation. “We provide transportation and a hot lunch, we go on different outings in the community, we do crafts daily, we play games, and we promote community and socialization,” said Johnson. To learn more about the Gallia County Senior Center and the services they offer, or to sign up for the day program, call 740-446-7000.